Eppendorf tubes were incubated on a shaker in a 37°C water bath for 15 minutes, 45 minutes, 75 minutes, 45 minutes, 105 minutes, 135 minutes, 1220 minutes and 1440 minutes for one of the fiber tubes and one of the blanks. 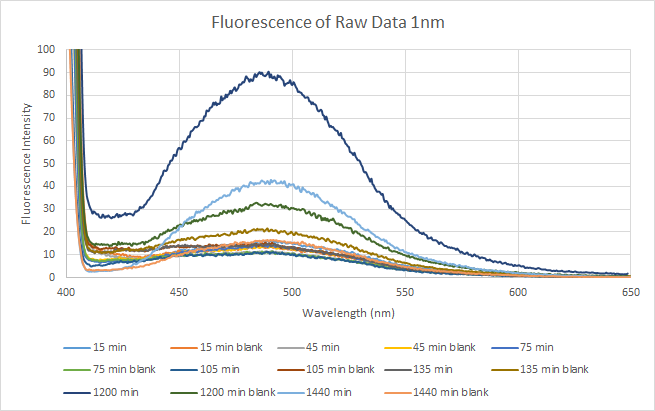 The image below shows the intensity for the fluorescence of samples and blanks from 400 to 650 nm. To find the concentrations of peptide released at the various time intervals the samples and blanks had the area of their intensity integrated from 420 nm to 650 nm. The equation (Wavelength2 - Wavelength1)/2*0.5 was used and the sums of each interval totaled. The samples were then corrected for by subtracting the total area of the blank from the total area of the sample. The resulting intensities were then used to calculate the concentrations based off the calibration curve made on 10/07/15. 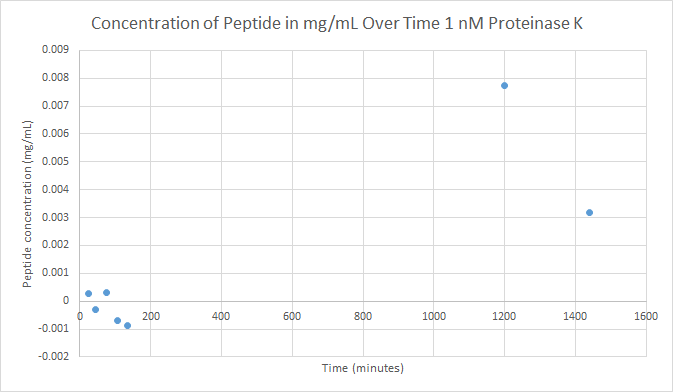 The graph below shows the concentrations of the peptides as a function of time. That so many early time data points are negative may either indicate that there is so little protein cleaved that background noise is affecting the results or indicate human error. That, combined with the massive spike at 1220 minutes, indicates that this data should be re-run at a later date. This page was last edited on 27 September 2017, at 01:21.